I hope that you all had a fantastic holiday weekend! Adam and I were lucky enough to spend some time with his family this weekend. On Saturday, we visited Woodstock Farm Animal Sanctuary with my FIL for their annual July Jamboree. It was such a great time - there was delicious food and some great music, but my favorite part of all is always walking around and visiting all of the rescued animals who call this sanctuary home. 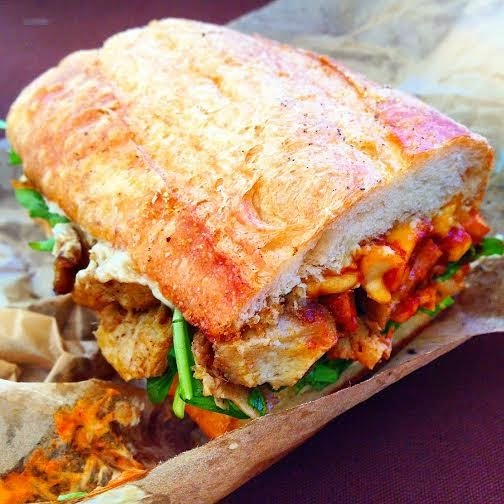 Although, a close second was the Lemongrass Seitan Sandwich from the Cinnamon Snail food truck! Later in the evening we met up with my MIL and Adam's grandparents for the local dirt track races, our annual summertime tradition. It seems like we spend more time people watching and catching up than watching the actual races, but I look forward to it every single year. Spending time with family got me thinking about some of my own childhood memories. I was fortunate to grow up in a house where honest to goodness home cooking was valued. We made everything from scratch, and my mom was always eager to allow me to help out in the kitchen. I remember the first thing I ever made on my own - Nestle Tollhouse Chocolate Chip Cookies. I must have made that recipe a hundred times! To this day I still use my own variation of this recipe and it always comes out perfect. Crunchy on the outside, yet soft and fluffy on the inside. 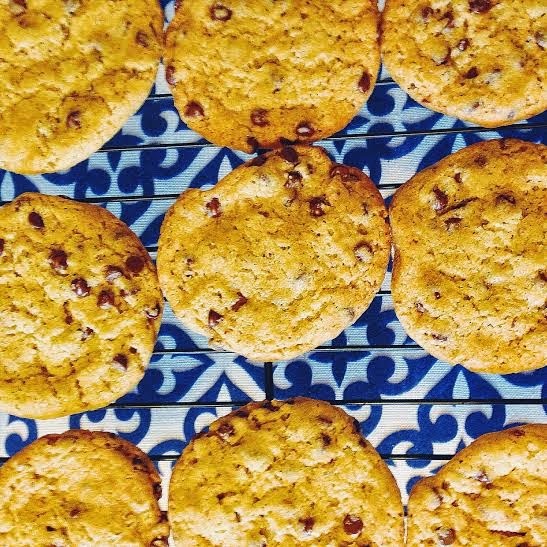 You can't go wrong with a classic chocolate chip cookie! This past Christmas my SIL got me an ice cream maker attachment for my Kitchenaid Mixer. Let me tell you, that might be the best gift ever! I've made tons of variations already, from cookie dough to chocolate fudge brownie and even red velvet. This time, I decided to try my hand at using frozen bananas as a base. The frozen bananas themselves were the perfect texture for soft serve, but a bit too strong of a banana flavor for me. I added two cans of full fat coconut milk, a tablespoon of vanilla and some agave and threw it in my ice cream maker. 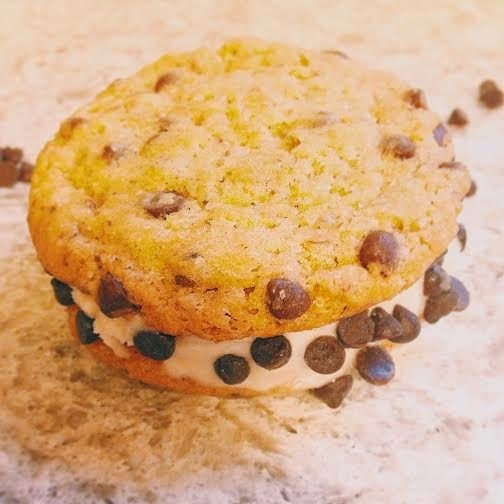 Combine this with chocolate chip cookies and a delicious ice cream sandwich is born! It's a bit of a process, but it makes about 15-16 sandwiches and totally worth the extra bit of effort! Preheat the oven to 375 degrees. Line 2 baking sheets with parchment paper. First, make your flax egg and set aside. In a medium bowl, combine flour, baking soda and salt and whisk. In a large bowl, beat Earth Balance with an electric mixer until creamy. Add sugar and beat for another minute until light and fluffy. Add vanilla and beat until combined. Add flax egg and beat for about 30 more seconds. Add in the flour mixture a little bit at a time, beating until combined after each addition. Reserve about 1/8th of the dough for later. Roll dough until you've formed something about the size of a golf ball. Slightly flatten with you hands on the baking sheet. Roll your reserved dough into small balls, about the size of a soy bean. Line them on a sheet of parchment paper and leave until the freezer until ready for use. 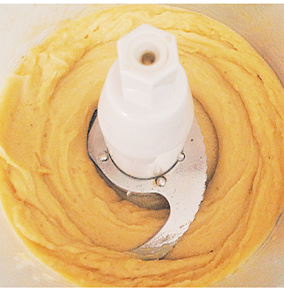 In a food processor, blend together frozen bananas and vanilla. Place in a large bowl and add in canned coconut milk and agave. 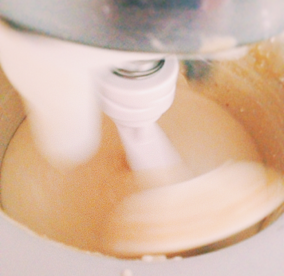 Transfer the mixture to the bowl of an ice cream maker and churn for 20 minutes. Once you've got the consistency of "soft serve" add in your cookie dough pieces and place in a container in the freezer for about 4-5 hrs, or overnight. Take a generous scoop of ice cream and top one of your cookies. Grab a second cookie and gently press down to disperse ice cream evenly. 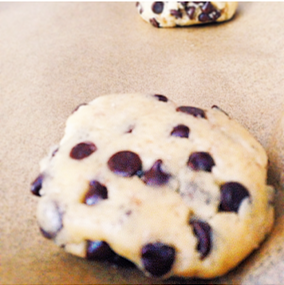 Then, gently roll your cookie sandwich in chocolate chips to coat.